This story is the first part in a four-part series about our Halfsy Hero Robert Rieck. Our series will follow Robert and three other heroes as they train for the 2017 Good Life Halfsy. Robert Rieck will not be running The Good Life Halfsy this year. In fact, Robert isn’t a runner at all. As a kid, he was effortlessly fast. He found himself unmoved by passing his classmates during required races for gym class, and coming in first meant very little to him. He was really more of a skateboarder. It required focus, but without disturbing his peace. A solo venture, and definitely not a school-sanctioned event, there was no competition. Just Robert on 4 wheels, pushing for nobody but himself. On September 30, 1996, running ceased to be an option, and pushing became his only hope. An injury that could have (and by most medical standards should have) been the end of Robert’s story became a new beginning. Robert will not be running The Good Life Halfsy, but he will be changing the game for Paralympic competitors this October. For more than 20 years, Robert has relied on a will-powered wheelchair to take him through the life he nearly lost. A C-5 quadriplegic, he has voluntary use of only 2 out of 35 muscles able-bodied people use in their arms, and absolutely no voluntary movement or control in his trunk. This could be the story of a man who watches from the sidelines, but this Halfsy Hero knows he isn’t just fighting for himself, but to change the identity expectations for people who didn’t know participating in life was still an option. 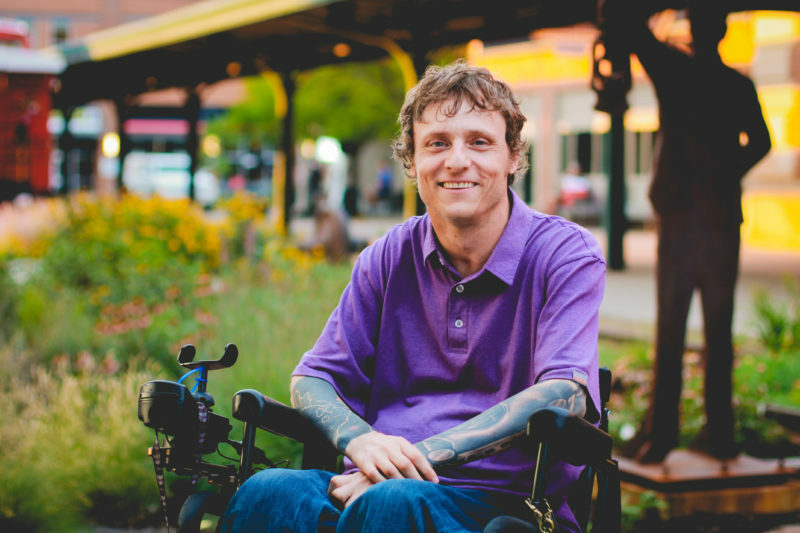 For more than 10 years, Robert has competed as a wheelchair rugby athlete. He trained daily, trudging through workouts to maintain the strength to maneuver his manual heavy chair. This isn’t a lightweight racing model, and he equates it to an able-bodied person racing in full football gear. Additionally, he relies on weightlifting belts to stabilize his trunk, which makes breathing a labor of its own. So why on earth would he be attracted to the prospect of a half marathon? Realizing that he was always working for the mythical “better” meant that the drive to work through pain, defeat, and exhaustion had to come from inside, each and every day. Forever. And to keep him accountable on this daunting journey, he brought along a few causes that are close to his heart including Vegan Outreach and Factory Farming Awareness Coalition, Black Cat House, and Matt Talbot Kitchen and Outreach. Robert knows he will never again compete on a level playing field, but he knew he wasn’t the only one who wanted back on it. His next moves helped make that field a little more accessible to everyone with the spirit and the drive to compete. Check back for more Halfsy Hero stories, and to read the next installment of Robert’s story!